Alarm woke us up at 2:30am. Picked up Mart and Virlon and Tim, Alex, and Max and were on the road to the Wpg airport by 3:30. After a week of record snowfall and cold temperatures, we were lucky that the roads were clear and driving was good this morning. The humungous Colorado blizzard that was forecast for today wouldn’t arrive until noon. Parked the van and sent an email to Walter so he’d know where we were parked when he’d pick it up later in the day. Checked in, and loaded my (double-packed) golf clubs on the oversize conveyer. Then lined up for customs. Said goodbye to Mart and Virlon, who were on their way to see Thaddeus in New Jersey. We had a 2-hour connection time in Vancouver before arriving in Honolulu at 2pm. (Turns out many afternoon and evening flights out of Winnipeg were cancelled due to the blizzard – we were lucky!) Took a taxi to our hotel and checked in. 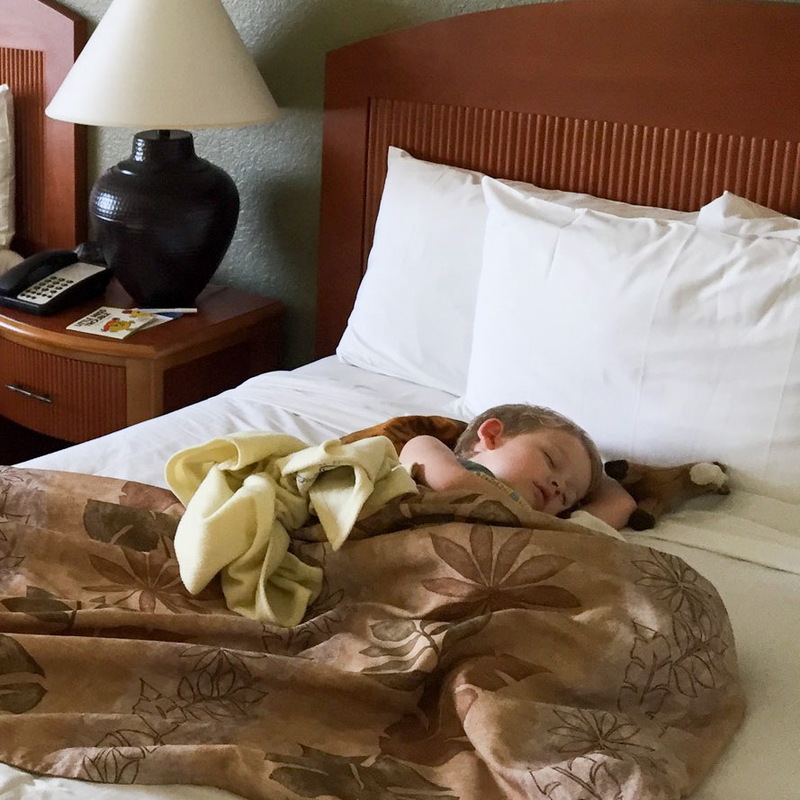 Sue and Alex had a bit of a rigmarole checking in – turns out we did NOT get the ‘suite’ we thought we’d booked – and we finally settled for 2 adjoining rooms with twin double beds in each. Oh well, Sue will fight it out with Expedia later. Our first night in Waikiki; supper at the Aston Hotel. After unpacking and connecting to (surprisingly good) Wi-Fi, we went out into the neighbourhood. 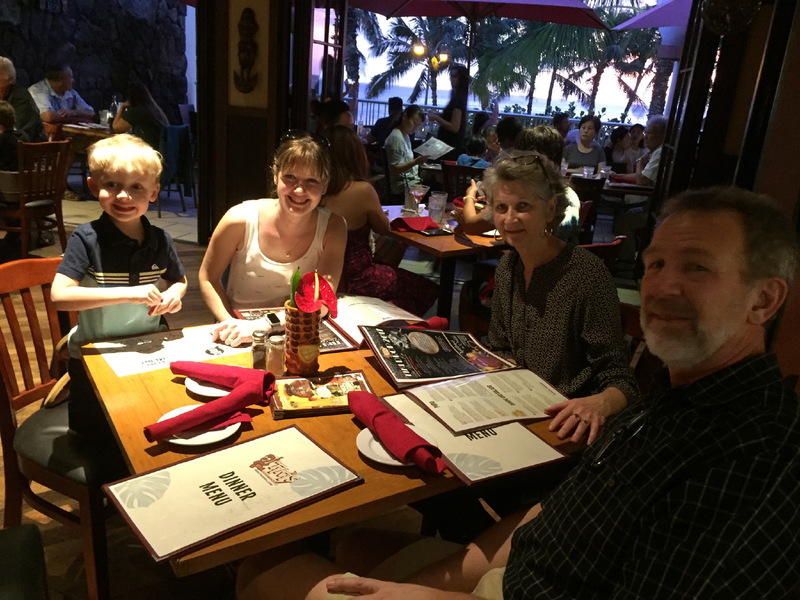 We took the free hotel shuttle bus all the way to the Aston Waikiki Hotel, right next to our ‘old stomping grounds’, the former Hawaiian Regent Hotel where we used to hang out 35 years ago – and had our first supper together at the Tiki Bar & Grill. Max was amazing – after staying up for more than 18 hours he was still smiling and carrying on and entertaining us! Back at the hotel he was asleep by the time his head hit the pillow. The rest of us were not far behind. Exhausted after an incredible and incredibly LONG day. So tired of seeing that same first post on this page!